Children’s, Japanese kimonos, as well as looking fabulous on children and making wonderful newborn/christening gifts, are ideal as display items, as they are much smaller than adult kimonos, so need less wall space. One can frame them, like the examples below, or simply hang the kimono from a narrow bamboo pole and pin the bottoms of the fronts out. The exceptional artwork on them makes them a striking display item. One silk, baby’s kimono I have in my personal collection has a wartime design on it, with soldiers, aircraft, tanks etc. It seems a very strange subject to have on a small child’s kimono but was seen as a patriotic theme during the war. 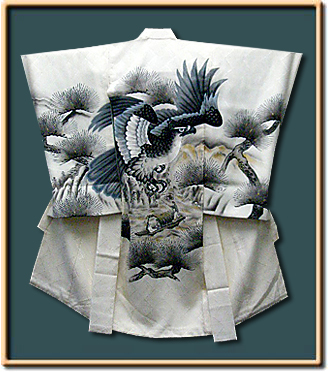 A pure silk, child’s kimono, like those shown below, is not an inexpensive item. They cost hundreds and even thousands of pounds (GBP), which makes vintage one, in good condition, a very good purchase, as it is a fraction of the price. 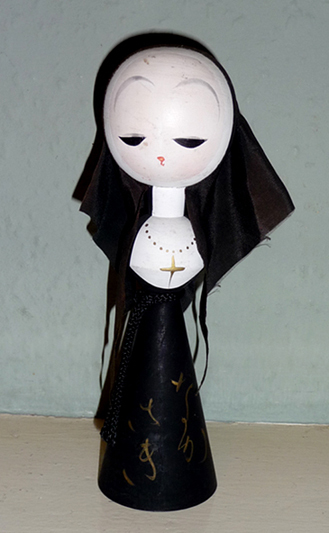 Kokeshi are traditional, Japanese dolls, with a very recognisable and specific style. Originally whittled by men at work, to take home to their children. They are very simple in design, a head and a body, usually with painted clothing and features, and no separately carved arms. 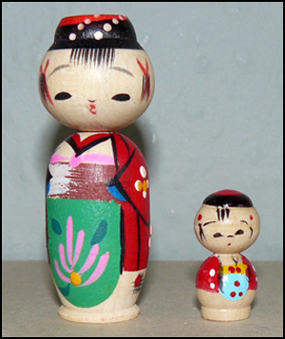 Another favourite of mine is the kokeshi doll below; a 1950s, nodding head, nesting kokeshi. 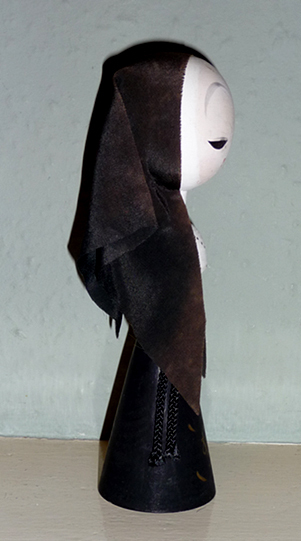 The head is made to turn and wobble and the doll opens up to reveal a little boy kokeshi hidden inside. I bought a box containing about ten of these, kept 4 for myself, my daughter and friends and sold the rest. There are so many different kokeshi dolls. 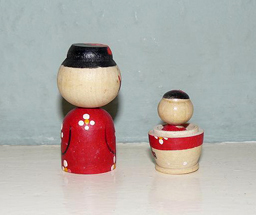 made in every style thinkable, and now there is a craze for collecting Momiji Dolls, clearly based on kokeshi, as you can see from the photo of a Momiji Doll below. 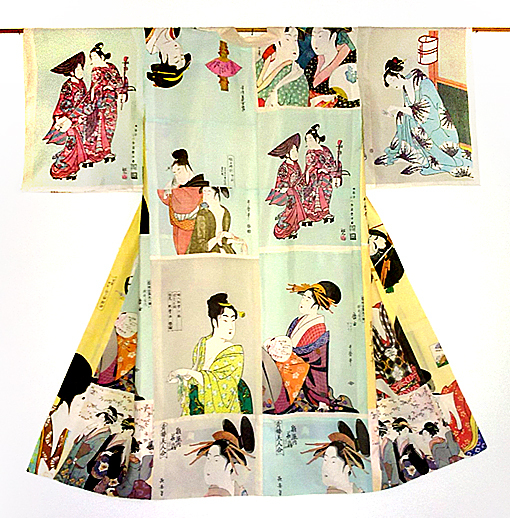 In the photograph you can see a most unusual juban (naga juban) kimono with famous ukiyoe images of geisha. These images are from woodblock prints by Kitagawa Utamaro (1754-1806). 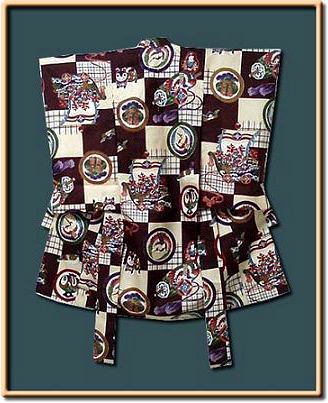 This kimono has been made by someone, in Japan, by creating a patchwork of the fabric pages from a textile sample book. It belongs to my daughter who has it hanging on her bedroom wall. 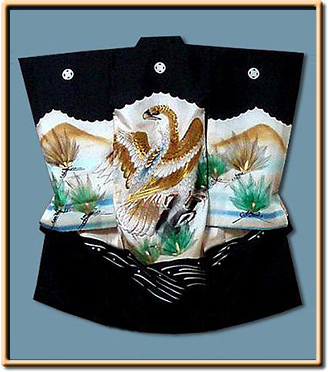 Being a juban kimono, it is shorter than an outerwear kimono, because jubans are not worn with a fold-over of fabric at the waist, so they are more or less ankle length, depending on one’s height, whereas outerwear kimonos are deliberately made way too long, so a fold-over (ohashiori) can be made at the waist when they are worn; being shorter makes it easier to display. When a child, my daughter had a colouring book full of these famous prints, which she absolutely loved. When I saw this juban kimono for sale, I had to buy it for her. If I’d had the wall space to display it in my own home, I might have been very tempted to keep it for myself. A lesson in how to put on a nagoya obi, with a taiko ‘knot’ at the rear. Nagoya obi have the sash section already folded in half and the rear knot section at full width. The video is in two parts. The woman in the video is wearing her kimono with the fold-over tied at the waist, to adjust length, and has, round her waist, a koshi himo (soft tie) under a (pink) date-jime obi around her waist. 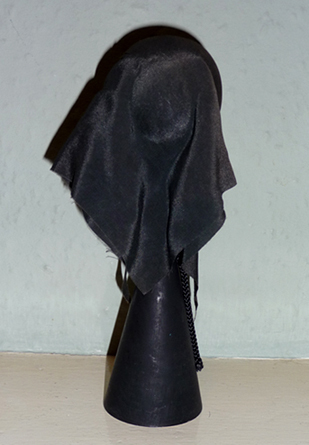 She also wears an obi ita (stiffening board) under her obi. Her (white) obi ita has an elastic strap round the back, most obi ita have no strap and are just held in place by the obi. She puts the nagoya obi on top of all those. You can also get pre-shaped, two part nagoya obi, which do away with all the time consuming, complicated tying, but look the same once on. The makura (pillow) she mentions is an obi bustle pad, which pads out the top of the rear knot and is hidden inside the knot, covered by an obiage. The obiage is a scarf-like tie that goes around the top of the obi sash and is tied at the front, then partially tucked under the sash. Around the middle of the sash, to help hold the obi in place, is a cord called an obijime, also tied at the front. Part two of lesson in how to put on a nagoya obi, with a taiko ‘knot’ at the rear, an obiage, makura and obijime. 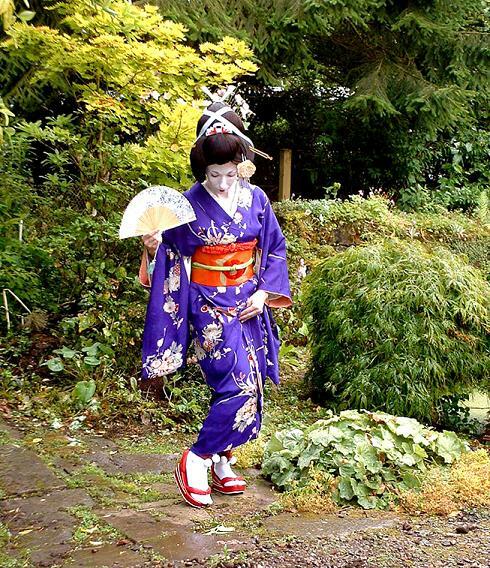 The ‘geisha’ in the garden, shown below, is my long suffering daughter, who patiently allows me to photograph her in an endless array of kimonos to display on my site, allowing people to see what many of them look like when on. In the photos below, she is wearing one of her own kimonos; that’s the kimono that made me feel I had to own one of my own and got my passion for kimonos started. Here are two videos I found on Youtube, showing how to put on a yukata kimono and hanhaba obi. It is in two parts below. If you only want the hanhaba obi instructions, they are in Part 2. In Japan they say, if you attend one kimono class per week, you will just about learn how to put on and wear a kimono in one year.